You've been invited to play the role of “PIECES” O’MATES in Murder Ahoy. 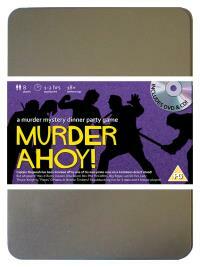 You are invited to a swashbuckling murder mystery set in the tropical waters of the Caribbean! Captain Mugwash and his pirate crew are shipwrecked on a desert island where they find a buried treasure chest. But during a drunken celebration on the beach the Captain is discovered slumped over the chest, murdered! Please join us to find out who buried the ol’ Sea Monkey! Most people here just know me as “the chef”. I’ve been serving slop and sea biscuits to the crew of the Dirty Monkey ever since I passed out drunk in front of Captain Mugwash three years ago. Being the chef certainly has its perks – no one wants to upset me for fear of what they might find floating in their stew!